On April 5, members of Ordain Women will again request tickets to the LDS Priesthood session. In March, the LDS Newsroom issued a pre-emptive statement that both contradicts current church doctrine and sends a confusing message regarding the manner in which the LDS Church makes decisions. In their arguments against female ordination, church members often claim that “the church is not a democracy” and thus members do not have the right to petition the prophet for revelation, an argument I understand. If a church is truly led by God, a top-down method of revelation makes sense. But the church seems entirely fine with democratic majority rule when it benefits the status quo. In October 2013, LDS spokeswoman Ruth Todd stated, “Most members would see such efforts as divisive.” In 2014, Jessica Moody reiterated this idea in her letter to Ordain Women organizers: “Women in the church, by a very large majority, do not share your advocacy for priesthood ordination.” By that logic, if the majority of women advocate for ordination, it would be a matter worth discussing—a viewpoint I am certain the church does not endorse. Either the church is not run as a democracy—in which case the desires of a majority or minority do not influence how the church is run—or church policy is dictated by what the majority of members believe. It cannot be both. The church also contradicts itself regarding the nature of revelation. 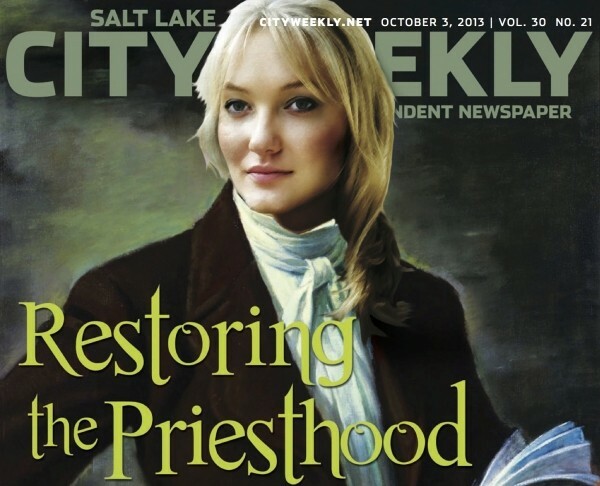 Moody’s letter declares that “ordination of women to the priesthood is a matter of doctrine that is contrary to the Lord’s revealed organization for His Church.” However, neither Jessica Moody nor the LDS Newsroom is authorized to reveal new doctrine. The letter speaks on behalf of the church, but not as the prophet, and not as an official declaration. While the letter is correct—women are currently excluded from holding the priesthood, according to current doctrine—there is not official doctrine that states that women will never hold the priesthood, or that women are forbidden to ask for ordination. If there were to be a new doctrine introduced, it would come from the First Presidency as an official declaration, after being voted upon unanimously by the Quorum of the Twelve, not from the LDS Newsroom. Moody’s letter represents another instance of the church contradicting its own standards and attempting to vilify the members of Ordain Women as going against a doctrine that does not exist. The church itself identifies doctrine as “the four standard works of LDS scripture (the Holy Bible, the Book of Mormon, the Doctrine & Covenants and the Pearl of Great Price), official declarations and proclamations, and the Articles of Faith.” Until the church formally introduces a doctrine regarding the permanency of a male-only priesthood that forbids women from pursuing ordination, using the church’s newsroom is nothing more than a stall tactic that places the members of Ordain Women in a theological limbo. Yes, the church institution, as represented by the LDS Newsroom, does not agree with Ordain Women’s interpretation of LDS doctrine. But until an official declaration is made, it seems that God might agree—another unintended message from the LDS Church. With its request that the members of Ordain Women join the anti-Mormon protesters across the street from Temple Square, the LDS Church sends a message of exclusion that contradicts the value of personal revelation—the fundamental belief, in Mormonism, that every member has the right to seek answers and ask questions. Former Relief Society President Julie B. Beck stated that “the ability to qualify for, receive, and act on personal revelation is the single most important skill that can be acquired in this life.” According to the LDS Newsroom, the church would rather that skill atrophy in the “free speech” zone. The church’s overall response to the Ordain Women movement challenges the very essence of Mormonism, a religion founded by a then un-ordained teenager with a question. By labeling faithful members of the church as “divisive” minorities who “detract” from Mormonism, the LDS Church betrays its own origin story. The church would not exist without founders and members asking questions about the will and nature of God. The church cannot encourage members to seek personal revelation and then punish them for the results. Fearing and ridiculing questions as “anti-Mormon” indicates a fear that God does not have all the answers—or that He’s no longer communicating them with church leadership. If God is always at the helm, questions should not render the church frightened of its own members. I respect the right of religions everywhere to dictate their own doctrine. But for many years, it was not the answers the church provided that sustained my faith—it was the questions. Believing I could ask questions and receive divine answers personally tailored for my soul thrilled me. To see the LDS Church recoil from my sisters who have earnest questions reminds me of the joy I felt in asking questions, and the sadness in realizing my church did not share my joy. I’m proud of the men and women who follow the example of Joseph Smith and ask the hard questions. I hope someday they will be heard. Stephanie Lauritzen blogs at MormonChildBride.blogspot.com.